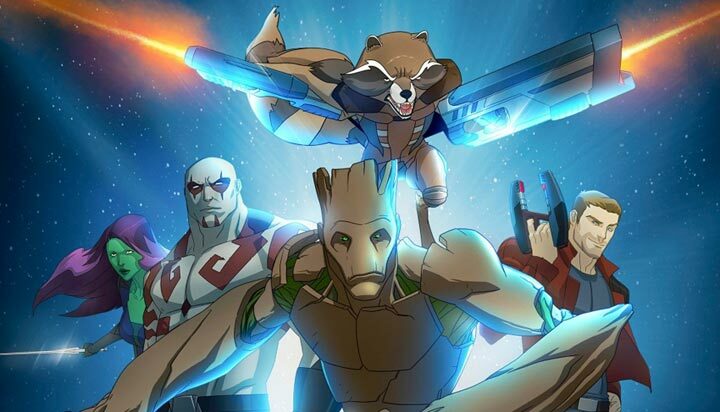 Disney XD's next Marvel series, Guardians of the Galaxy, has officially been revealed. The show is set to debut on Saturday September 26th on Disney XD with two back-to-back premiere episodes, airing from 9:30 to 10:30 pm, ET/PT. Working the way up to that big debut, Disney XD will be showing 2 part character shorts every Saturday through August. On Sat. Sept. 26th- the big one-hour premiere of Guardians of the Galaxy which will be the encore presentation of "Road to Knowhere" followed by "Knowhere to Run." The synopsis for "Knowhere to Run" is: "the Guardians struggle to subdue the suddenly-sprung-to-life Celestial head that is the Knowhere space colony, as well as storm Korath's ship to rescue Quill, Gamora and the mysterious CryptoCube that holds the Cosmic Seed." Then on the following day, Sun. Sept 27th Marvel's Guardians of the Galaxy will become available to watch for Disney XD users on WATCHDisneyXD.com and the WATCH Disney XD app for smartphones, tablets and connected TVs. James Arnold Taylor (Star Wars: The Clone Wars) as Yondu and Cosmo. Disney INfinity 3.0: Ant-Man INfinit-Teased! Ant-Man: Ant Invasion of Marvel Heroes 2015!